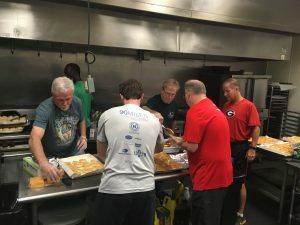 August 18, 2018 – FTHP, Inc.
Just a little glimpse of what goes on behind the scenes at our warehouse every Saturday morning preparing breakfast for our friends on the street. With the threat of rain, we had to cancel our sponsor this weekend so our crew arrived extra early at the warehouse and went to work on preparing 230+ breakfast sandwiches to pass out at both our locations. Rain or shine, our friends are waiting patiently for us to arrive each and every Saturday morning and we never want to disappoint. It takes a village to prepare for each Saturday and these guys make it look so easy! 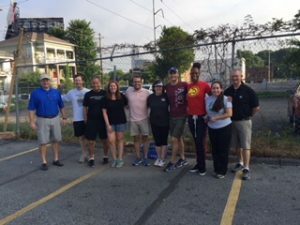 Feeding the Homeless Project, Inc. is so blessed to have an amazing group of dedicated volunteers!